Rank your site in search engine results is always a very hard stuffs especially for newbies. People use different SEO techniques for high website ranking in search engine like Google. No doubt Google is the best search engine in the world and almost 80% traffic sharing by Google and 20% others. Search engine have such a mysterious calculations that hand out page one search engine ranking for websites and blogs based on different tactics and secret. There are hundreds or thousands of programmers, SEO expert, scientists, analyzers are constantly working to increase their working and ranking of search engine. There are dozens of SEO companies are available here that sell their SEO services to all different businesses on the basis of “Guarantee First Page Rankings” in Google. This is not enough but deal for some specific keywords and it all depends on the price that they’re charging. But if you want to try and compete world biggest brands on a single keyword then these companies charging according to that era. It have not matter if you’ve a awesome stylish website or blogs as much beautiful as you can, but if you’re lacking sufficient SEO (Search Engine Optimisation). It is very important thing for getting higher ranking in any search engine like Bing, Google, Yahoo etc. From time to time, the real exact figures must be changed in the top ten for any given search results for websites and blogs. It is based on total number of clicks that are vary slightly be different and changed from study to study. 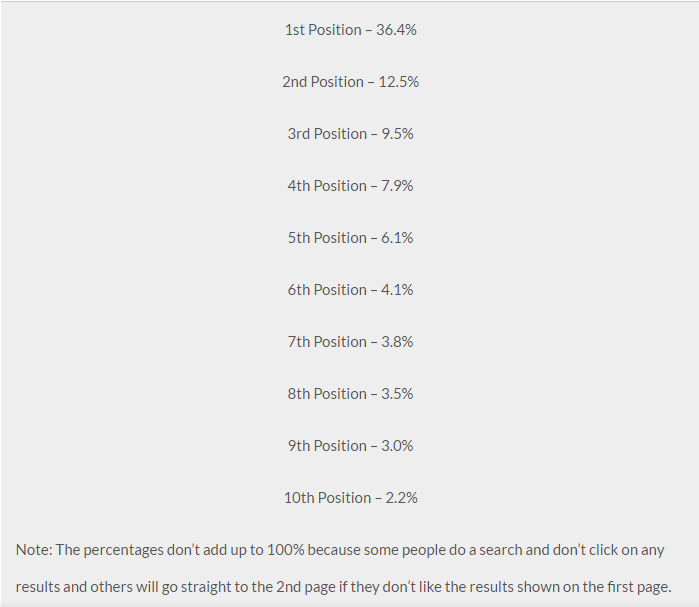 Now check out the “Google First Page Ranking” and first top 10 results of how much averages people clicks on the results. After viewing this, you’ve an idea about the ranking and it’s importance. These results and ratios are just as an example and estimated, because I already said that, SEO changed time to time. These results are important for those who want to getting first page rank in search engine. The main thing behind this study to show you just highlighted how much of a difference a 1st place ranking as compared to 10th place ranking. 2 What is Search Engine Optimisation (SEO)? 11 Video: How much time I spend on Meta tags? 15 Video: Are Pages from Social Media Sites Ranked? 16.1 Want to Start Building Your Own Website or Blog? Think about it – it’s quite be important for get more and more traffic from search engines if your site ranking is in first page and first 3 – 4 results. Normally people clicks on the first 3 – 5 results, so always try to compete for those positions. Here I discuss some important “SEO Optimisation Tips” and different ways that helps you to understanding how to rank on Google first page and which are the different factors that used for higher ranking. Before doing further first of all you must know about the term “SEO”? In general words – SEO is the marketing technique which is used for optimizing your websites for high rank in search engine like in Google. It is the process in which , the visitors / traffic on your site must be improved if you doing properly. People always wants to getting higher organic traffic, then search engine is the best place and SEO is the best technique. There are several methods and techniques which search engine recommended to webmasters for improving their pages ranking without any paid tactics. I’ve listed below some important factors and ways that helps you to guarantee page one ranking in Google. “Content, Content & Content” You’ve ever seen the importance of Content Creation and writing which is used as the most important and best marketing tool over the last few years. No doubt, in 21st Century, everyone try to find information and WEB is the best option for find information. This is the reason why Google is putting such a high value on unique content. Creating fresh and unique content with great contagious which contains videos too. eBooks and blog posts also has a very big side benefit in content creation strategies. The other important and useful benefits of unique content is that people will link back to your website to their own sites and hence Google gives you more profit and preferred to rank you on first page as compared to millions of other results. People doesn’t value it but believe me, if you’ve a blog on a single niche like on “SEO” , “Blogging” , “Make Money Online” etc, then search engine preferred it to rank high as compared to multi-niche blogs. The reason behind it is that, unique niche contains relevant contents that helps Google and all other search engines to figure out sites for that particular topics or keywords to rank you higher. Always published relevant and quality contents because it is the number one driver of your search engine rankings and Google tells that there is no substitute for a great content. Research a high paying and most relevant keywords for every single page of your website / blogs. Also don’t forget to use headings H1, H2, and other emphasis tags like bold, italic, underlined for highlight relevant keywords or phrases, but remember that don’t overdo it. The most important factor for high search engine ranking is the “Keyword Research”. If you’ve an ability to do high paying keyword research, then you’re become the best expert in ranking factor. With proper keyword selection, you’ve getting high traffic and more visitors. As much smartly you select a keyword for every single web page, as much rank high. There are many keyword Tools available for proper and useful keyword research. You can use these keyword tool, and finding targeted keywords. Content is the king of your blog. You’ve noticed probably, I feel pretty strongly about content creation. Search engine loves blogs / websites that published not just content, but quality content on their blog regularly. Regularly updates sites is viewed as one the best indicators for a site’s relevancy, so be sure to keep it fresh always. Search engine loves fresh content so make your site fresh with quality contents. Lacking of the ability of finding your audience, many of us doesn’t get ranked. Many new bloggers doesn’t know about their audience, and this is the big factor that drop down their ranking. This factor start before starting a blog / website. First of all you must do to find targeted audience and then use different marketing techniques to share your content. Using marketing tools, you can easily reach to your targeted audience like Facebook Marketing, PPC Marketing, CPM Marketing etc. There are many tools available, but the most famous, popular and important tool for finding targeted audience is the “Google Trends”. You can use it freely and find your targeted audience first and then re-target it via publishing unique contents. Backlinks is the backbone of search ranking. It is the link or simply said that Backlink, that use to be brought to another referring page. Backlinks are considered to be as the “like votes” for your web page that tell search engines of some other web page like and utilize your web page for some kind of information. As much more websites links to your site, as much higher ranking your site will be. All websites doesn’t make the same effects, because many of these sites have own poor ranking, that why Google don’t prefer them. But anyhow, all these links gives you somehow benefit to your webpage. So always try not to create backlinks, but quality backlinks, that helps you to getting more and more search engine ranking and higher traffic. Metadata are some kind of tags that are used after <head> tags, when designing your website. These are some kind of information about the contents of your web page. If you’ve used any kind of CMS system for managing your site, then they provide three different metadata tags that you use for high ranking in search engine. Video: How much time I spend on Meta tags? Title is the most important factor that is responsible for page displaying at the top of the browser window. It is most important metadata on your page. Meta description tag also provide the benefit to webmasters. It is the unique texts that’ll be appeared in search result pages (SERP). These are some search phrases that people type in the search bar, when they want to find your page. Don’t get greedy – to use these keywords in your web page. Always use, search engine allows you to use them and get ranked. Few years back, everyone use PC computer for using internet. Then after that Laptop will be used, but with the passage of time, computer machines changed and now a days everyone use Smartphones. Smartphones are the best way to play games, watch videos, use internet etc. People use mobiles for visiting different websites on the internet for finding information. So it is very compulsory for us, to make our website’s mobile friendly, because if your site is not responsive and doesn’t load fast on mobile devices, or their look was not good on mobile, then you’ve lost much traffic. According to different surveys, mostly users almost 70% use internet through mobile devices like smartphones, and remaining 30% contains PC, Laptop, Tablet etc. So I recommended you to make your site mobile friendly or if you’re use CMS system then always use responsive themes for your site. Images plays an important role in search ranking. People more engaged with content that use images inside their blog posts. Each image and video that you’ve used within your site are important in SEO point of view. Always optimize your images by adding their ALT tags wisely. ALT Tags also known as the alternative text description. These description allow search engines to locate your page using the different keywords found in your image and video descriptions. ALT Tags increasing the opportunities for you to found your site more. As much ranking your site, your page rank raises automatically. So always describe your visual and video media using this alternative tags. Which your page crucial – search engine display and rank in SERP (Search Engine Result Pages) to users. In this internet age, social media becomes the most powerful and amazing source of information and people use it for many ways. Some were use social media sites for enjoyment, some of us use it for finding different information and someone just for connecting to their friend and relatives. Search engine loves those sites whose presence are high in social bookmarking sites. So always make it possible to use social media sites for sharing your contents. Video: Are Pages from Social Media Sites Ranked? You can also drive a huge number of organic traffic from these sites in which the most useful and popular sites are Facebook, Twitter, Google+, Pinterest, StumbleUpon, etc. If your website speed fast then there are many benefits for you. Google loves fast loading sites. I saw many websites that load very slow that is the very big factor behind the low ranking sites. If your website speed low, then search engine robots now recommended to their users, because they want to your site loading speed faster. So if you want to get first page ranking in Google, then it is very important for you to make your site responsive and fast loading. Want to Start Building Your Own Website or Blog? Use all these tips, that will helps you to increase website ranking in Google and all other search engines. If you utilize all these tactics with proper planning, then believe me, you’ll get high first page ranking easily in Google. If you’ve any question regarding this post, then feel free to contact me or comment in the section below. For more my latest guides, subscribe my newsletters. Don’t forget to share this with others on Facebook, Twitter, Google+ etc.